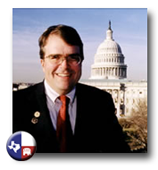 John Culberson was elected in 2000 to represent the 7th District, a seat formerly held by President George H. W. Bush and House Ways and Means Committee Chairman Bill Archer. In Congress, John’s priorities include strengthening the economy by cutting taxes, creating jobs, and balancing the budget; securing the border, advancing medical and scientific research; and improving Houston transportation. John is a member of the House Appropriations Committee, which is responsible for funding the federal government. His position on the committee allows him to promote his vision for effective government – lower taxes, less regulation, and more local control. In 2011, John was selected to chair the Subcommittee on Military Construction and Veterans Affairs. With the third largest subcommittee budget on the Appropriations Committee, John is committed to providing our military and veterans with the very best care and resources while eliminating inefficient programs. In 2011, John was also selected to be the Vice Chair of the Homeland Security Subcommittee. John believes the lawlessness on the border requires immediate action, and in close cooperation with the Texas Border Sheriffs’ Coalition, he continues to secure federal funding for the sheriffs to enforce existing law and provide the necessary support for our Border Patrol agents. In addition to his leadership roles on two Subcommittees, John also serves on the Commerce, Justice and Science Subcommittee, where he’s a tireless advocate for law enforcement and NASA. John is also a zealous advocate for increasing our national investment in medical and scientific research. He recognizes that breakthroughs in these areas are vital to meeting the economic and technological challenges we face in the 21st century. John also believes in cost-effective transportation projects that reduce congestion on Houston’s busy freeways. His signature transportation project, the Katy Freeway expansion, is the nation’s first combination Interstate highway with locally-owned toll lanes. The project was finished years ahead of schedule, and according to TxDOT has cut travel time in half. A life-long Texan, John Culberson earned his Bachelor of Arts degree in History from Southern Methodist University in Dallas in 1981. After college, he worked for his father’s political consulting and advertising agency before earning a Juris Doctorate degree from South Texas College of Law in Houston. Before his election to Congress, he practiced law as a civil defense attorney with the Houston firm Lorance and Thompson. In 1986, John was elected to the Texas House of Representatives while he was a law student. He spent 14 years in the Texas House and in his last term in 1999, he was selected by his peers to serve as Minority Whip. He is best remembered in Austin for his successful effort to restore state control of the Texas prison system from a federal judge. After introducing and passing legislation in the Texas House, and drafting key pieces of federal law, John fought in court on behalf of his legislation and the ruling returned full authority over state prisons to the Texas Legislature. John and his wife, Belinda, have been married nearly 20 years and have a 14 year old daughter, Caroline. They are members of Memorial Drive United Methodist Church. "I supported a budget alternative that would cut taxes and reduce spending. It is time to let Americans keep more of what they earn and for the government to spend less. It is time to start trusting and empowering individual Americans instead of the federal government."